After the successful completion of the Spectacular Holidays, Cinepax Cinemas has now come up with a New Year Quest – where cinemagoers across Pakistan watching any movie at Cinepax Cinemas will have a chance to win return tickets to Prague, Czech Republic, courtesy flydubai. 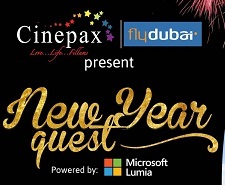 With many exciting prizes including smart phones, LEGO Merchandise, meal vouchers the Cinepax New Year Quest will be ongoing till 26th January 2016 for Cinepax customers from all over Pakistan. I know my toys andGulmohar Advertising. 21 screens in six cities across Pakistan including Karachi, Lahore, Rawalpindi, Faisalabad, Gujranwala and Murree, having total of 4,302 seats nationwide. 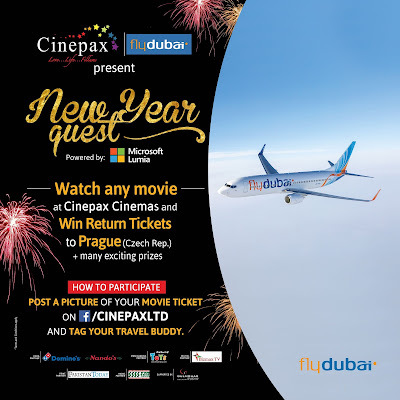 Cinepax offers the best quality in cinemas to Pakistanis with friendly and family oriented ambiance.